Sprinkle the plums with the crushed amaretti and the sugar in an ovenproof dish. Prepare the topping by sifting the flour into a mixing bowl and rubbing in the butter until the mixture resembles fine breadcrumbs. Stir in the sugar, cinnamon and hazelnuts. Sprinkle the topping evenly over the plums, pressing it down very lightly. 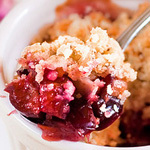 Bake the crumble for about 45 minutes, until the topping is golden brown and the plums are cooked. Serve with custard, cream or vanilla ice cream. Make a fine pastry by combining in a blender 200gr flour, 150gr rather firm butter, a pinch of salt, 1 teaspoon of sugar and a little olive oil. Incorporate 100ml water and work together briefly (you should still see bits of butter). Roll the dough finely and cut 16 circles of about 12cm with a pastry cutter. 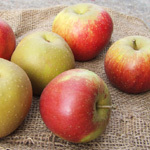 Place on non stick baking sheets, cover them with very thin slices of apple, Brush with 50gr of melted butter and sprinkle lightly with caster sugar. Bake in a pre heated oven at 220*C for 15 minutes. Turn each tartlet over with a spatula, dust the reverse with icing sugar and grill until the sugar is caramelised. Leave to cool for 15 minutes. Place 4 tartlets on top of each other (apple upwards) on the plates. Before serving, cover each jeu de pommes with 1 tbsp of warmed acacia honey and sprinkle with a little Calvados and a few drops of lemon juice. This dessert is wonderful accompanied by a lemon sorbet. Make a béchamel sauce or use a ready made one. Season with salt, pepper and a pinch of nutmeg and add grated Coolea. Fold in the egg yolks. Whisk the whites to stiff peaks and fold them in too. Heat to oven to gas mark 7 (220C). 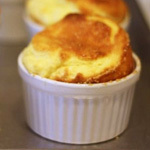 Butter a soufflé mould 8inches in diameter and lightly coat with flour. Pour in the mixture, turn the oven down to gas mark 6 (200C) and bake for 30 minutes. No matter how good it looks, don't open the oven door during cooking. When well risen and with a golden-brown colour on top, take out of the oven and serve immediately. Trim any leaves off the beetroot but don't cut the bottom tail. Place in boiling water and leave to gently simmer for 40 minutes to an hour. Drain and leave to cool for a few minutes until ready to handle. Then under running water, gently rub away the skin with your hands - it should come away easily. 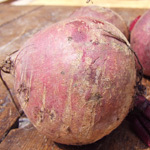 Cut the beetroot into appealing wedges. Heat some extra virgin olive oil in a pan and add the beetroot. Spoon over 3-4 tablespoons of good quality balsamic vinegar. Add the rosemary, some salt and pepper and simmer for 5 minutes until thick and sticky. Now to plate up. Add a handful of pea shoots or other baby leaves to each plate. Top with the balsamic glazed beetroot, crumble chunks of goat's cheese over the top and sprinkle with shelled walnuts.